$300.00 USD Daily Great Location! Welcome to Casa Chill, where much like the name suggests, you will most likely relax and just chill out near the pool during much of your vacation. With a full concierge management team there to help you with anything you need, there's no reason to leave this little oasis. Although if you feel like leaving the house, you will find the beach within just a short walk through a quiet little walk through the forest. There are also many restaurants and a small convenience store within a 5 min walk of the house. The management staff will welcome you to the house and they offer everything to maximize your vacation and relaxing time, from grocery shopping, airport transportation, as well as any tours and excursions you'd like to experience while you're here. The outside of the house offers secure gated parking, very nice landscaping, plenty of outdoor living and dining space, and a fabulous pool with a waterfall. There's the main house with 3 bedrooms, and 2 baths. Each room equipped with storage space. There's also a loft for extra sleeping space and serves well as a separate home office or reading area. The kitchen is well equipped with everything you need to cook and enjoy gourmet meals together with your family. Boasting beautiful granite counters, custom made wood cabinets, a six burner gas stove and oven, plus a large refrigerator. Also complete with blender, toaster, coffee maker and rice cooker. 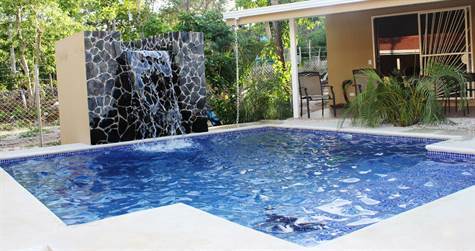 There is a separate guest house with it's own kitchen, and private bath just on the other side of the pool. Onsite laundry is there for your convenience. Daily housekeeping is included in the rental rate. Fresh linens, bath towels and beach towels are provided for you. A truly relaxing and luxurious experience at an affordable price!